Created by the 2008 interns and expertly maintained by Horticulturist Angie Andrade-Foster, this delightful water garden features tumbling water and a classical, tiny, red, Marliac waterlily Nymphaea ‘Ellisiana’ (Hybridizer: Latour-Marliac). This darling garden is beckoning to see you. The featured Rocky Mountain Legacy (RMLC) waterlilies are displayed here and all are unique, beautiful and Gold Medal winners. The six hardy RMLC waterlilies are: N. ‘Denver’ (hyb. : Strawn), N. ‘Denver’s Delight’ (hyb. : Tomocik), N. ‘Colorado’ (hyb. : Strawn), N. ‘Cynthia Ann’ (hyb. : Strawn), N. ‘Joey Tomocik’ (hyb. : Strawn) and ‘Attorney Elrod’ (hyb. : Tomocik). The RMLC waterlilies have again performed magnificently all summer and are also displayed in the upper (Victoria) Monet Garden pool. N. ‘James Brydon’ (hyb. : Dreer) is classical and flowering nicely in the Victoria Monet Garden pool. It is one our staple varieties and our Gardens are famous for its exceptional performance, year after year. In this pool and in the Monet Pond is a pearly white gem. From nearby Berkeley Lake, this very special (unnamed) waterlily, is as charming as it is beautiful. Note the Olympic colors here (black, blue, green, red and yellow) symbolizing union. Also recognize the many color shades, shapes and forms. There are over 1,700 named waterlily varieties, a reflection of the diversity achieved through hybridization. 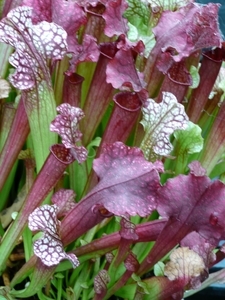 A portion of the sales of the vibrant N. ‘Pink Ribbon’ (hyb. : Songpanich) goes towards combating breast cancer (Susan G. Komen Breast Cancer Foundation). In a similar way, a portion of the sales of deep purple N. ‘Lindsey Woods’ (hyb. : Nelson Water Gardens) goes to the Texas Children’s Hospital in Houston. These showy waterlilies are on the east side of the Monet Pool at the end of the east-west pathway. Lotuses (Nelumbo cvs.) are tastefully displayed through out the Gardens’ pools. The yellowing, plate-like lotus leaves in the Romantic Garden pool are the first sign of a late summer transformation. Shorter days and cooler temperatures echo a push towards dormancy. On the plus side, the waterlily leaves now take on a new dimension characterized by color changes to red, orange and purple. And the reflections are more dramatic in response to a lowering sun. The prized hour-glass shaped seed pods remain intact for our visitors to enjoy throughout September. Splash some water on the water resistant leaves and ponder why it is impossible to get them wet. And, discover why. Carnivorous Venus Fly Traps (Dionaea muscipula) and pitcher plants (Sarracenia cvs.) are found at both entrances to the Fly Trap Feast. Close to the north entrance is a demonstration display showing the use of aquatic plants as filters, a fine example of sustainability, one of the Gardens’ important core values. Enjoy the lively container gardens here and also tactfully framing the Victoria and Monet pools. A gentle walk through the Japanese and Gates Gardens might be much appreciated considering all of the excitement in the upper pools. Can you find a hidden bench to rest and dream your heart away? Leaving our renowned Rock Alpine Garden we find a newly-created peaceful water garden (Birds and Bees Walk) with soothing churning water and another fine specimen of possibly our most astute waterlily, N. ‘Denver’s Delight’. 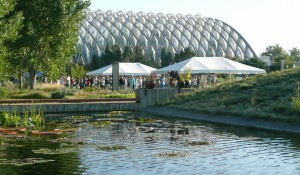 A final thank you to all who have so kindly contributed to the 2008 water garden displays.